One of the biggest sellers at Tokyo Disney Resort just so happens to be household items, and these aprons can turn around any dreary day in the kitchen. The rise in Princess-themed merchandise seems to be ongoing and this includes kitchen supplies. Donning such beautifully crafted and intricately designed aprons will only give more reason to flutter around the kitchen. Only three designs are presently available in the style of Rapunzel, Ariel, and Snow White. Rapunzel’s apron is the most detailed of the bunch with subtle emblems and flourishes decorating the entire bodice and the tell-tale corset in the front. Snow White’s takes on a more classic look with white lace lining the bodice and the skirt. Ariel’s has seashell patterns adoring the tail portion of the apron alongside a light purple bodice resembling her purple bikini. 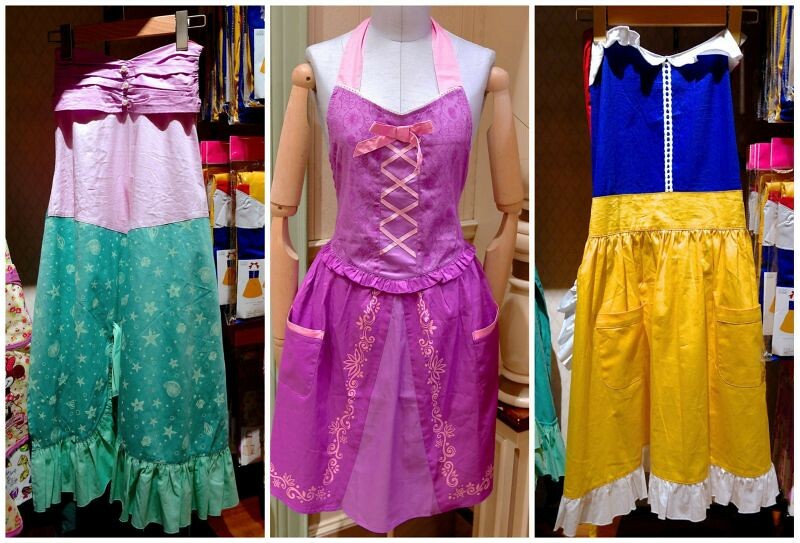 Personally speaking, the most attractive point about these aprons is that Rapunzel’s and Snow White’s has pockets which, as every woman knows, is a diamond in the rough for any piece of clothing. Each apron goes for 3500 yen. All merchandise © Disney and images credited to MezzoMiki.